Forecourt used for filming of scene for "A Star is Born"; photo of theatre captures camera crew in street to the east of canopy. 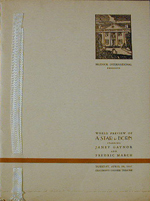 An issue of The Playgoer, dated Wednesday, March 10, 1937 (1st Week), exisits at the Academy of Motion Picture Arts and Sciences Margaret Herrick Library for this engagement. "The First Modern Picture in Technicolor"
30¢ to 1 PM; "Come before 6 and Save"
"The Greatest Event in the 20th Century - Complete in all its Spectacular, Romantic and Glamorous Splendor (Subject to delivery by air express)"
An issue of The Playgoer, dated "Week of" May 17, 1937 exisits for this engagement. M-G-M Preview "Of one of the most important pictures of the year" — probably "Captains Courageous" — ED. "Now at Popular Prices - Always Comfortably Cool"
Riette Kahn is shown at the wheel of an ambulance donated by the American movie industry to the Spanish government in Los Angeles, California, on Sept. 18, 1937. 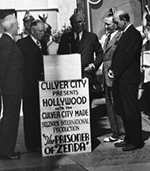 California Governor Frank Merrian alongside Culver City and Hollywood officials, who conduct a "Bury the Hatchet" ceremony on Wednesday, October 6, 1937, by presenting the Selznick International / Culver City-made The Prisoner of Zenda to members of the Hollywood Chamber of Commerce. "Doors open at 11:30 AM - First Time at Popular Prices"
Late "Owl Show" of "Navy Blue and Gold." 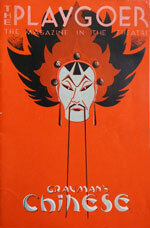 An undated issue of The Playgoer exists for this engagement.